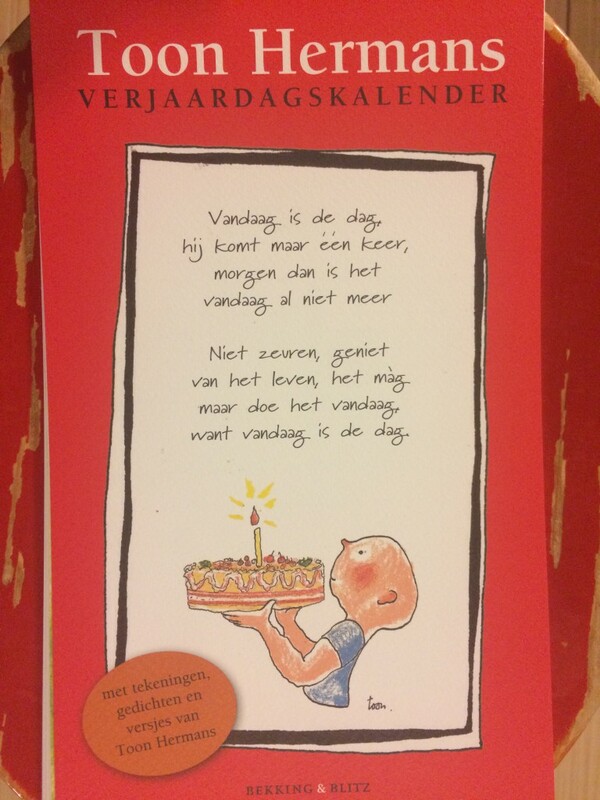 When I was a boy, my grandparents had a birthday calendar in their toilet, just as many Dutch families do. On twelve pages – one for each month of the year – the calendar listed when their (grand)children and friends had their birthdays. As the calendar didn’t mention the days of the week, my grandparents could use it year after year. want vandaag is de dag. cause today is the day. While I do care about my friendships, I am terrible in remembering birthdays. Even Facebook’s notifications – where every birthday becomes a number in a red box next to a bell, asking for your attention – do not help me. I am not as intimated by red numbers anymore as I was when I first got Facebook and a smartphone. I think birthdays are important: it’s worth celebrating life, and it’s worth celebrating others that are important to you. Humans are social animals, and we need others to be happy. A birthday offers the occasion to have a small celebration, to appreciate the year that has past, to spend time together in pleasant company, or just send our good wishes. I’d imagine there to be a positive correlation between sending and receiving birthday wishes and happiness (though I didn’t come across any research on birthdays and happiness – I suggest this to be subject of further research). I thus believe it’s a worthy goal to change myself, and get better at birthdays. Therefore, one of my New Year Resolutions this year is to remember my friends’ birthdays. Reminiscing about my grandparents’ birthday calendar, I set out to get the best tool I could think of to support me in meeting this resolution: an old-fashioned birthday calendar. I even managed to get one with the very poem lighting up my grandparents’ bathroom. So I hope that 2019 will be the year of remembering and celebrating birthdays. Because many days this year, it will be “today is the day” for one of my friends. And I hope these birthdays will be happy ones. In the beginning of this year, I formulated no less than ten New Year’s Resolutions. For me, the end of the year is the natural moment to look back and review what I experienced and achieved throughout the year. Yes! And it is a very special experience. Moving in together comes with some challenges. But these challenges are insignificant in comparison to the wonderful pleasure of being together every day. Fairly well. Especially in the beginning of the year, I used sleep-tracking apps. They helped me somewhat improve my discipline in going to sleep and getting out to bed on time. But I haven’t systematically used them all year round. And my sleeping habits still can improve. Not bad. Especially after summer, I’ve opted for a somewhat slower frequency. I’ve taken the chance to take on some speaking occasions presenting my work in this field. But maybe most importantly, I’ve visited two ‘happy countries’ this year: Denmark and Bhutan. Could be better. I regularly do yoga, but not every week. And while I ran a personal best at the 5k (22 min 20 seconds! ), I have only ran in training for that race, not all year round. Yes! And I celebrated it well, spending a weekend in the Belgian Ardennes with a group of friends. Yes! I spent two weeks in both of them, discovering different towns and landscapes and learning a lot about their culture. And apart from these two, I also visited Denmark for the first time and made stopovers in Nepal and Qatar en route to Bhutan. Almost. I’ve had a good amount of inspiration in watching TED talks this year, with topics ranging from basic income to indoor plants to improve air quality in house and from the strength of Muslim women in peace processes to cold-water surfing. While I saw many, I don’t think I got to one per week. And unfortunately I did’t attend any TEDx events this year. A little bit! A quick glance at my current happiness bookshelf suggests there aren’t too many additions: books on the November GNH conference in Bhutan and The Power of Negative Emotions being the exceptions. Still, (un)happiness was also a theme in other books that I read, such as Haruki Murakami’s title Norwegian Wood. And reading A History of the World in Twelve Maps also made me happy! Yes! Two and half years after joining, I finished Toastmasters International‘s Competent Communication programme. And I undertook some public speaking opportunities to talk about my discoveries on happiness. Especially in the beginning of the year, I occasionally took a glance at the list to remind me what I wanted to achieve. But as the year progress, I took more and more distance. And now, I don’t even understand why I needed ten goals.